This is an article I wrote for the second edition of the New European. 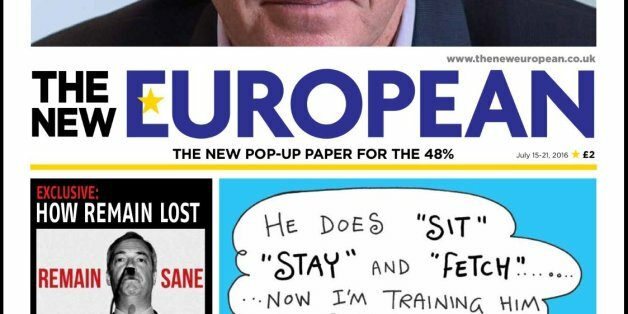 The New European is a fascinating publication, it was set up from idea to first publication in 9 days. It’s kept its costs very low and exists to serve the 48% of people that voted to Remain. It will disappear once the anger of the Remainers dissipates, of course this could be never. On Friday the 24th the UK advertising industry was where it always is in that last week of June. It was celebrating global creativity down in Cannes. Fully expecting a remain result, we had voted by post and as French time met midnight we were in good spirits. And then Newcastle happened, followed by Sunderland and from that point on in the count I think we all knew it was over. We woke as stunned and despondent as the rest of the 48%. But, just like hearing of the death of a family member when you are half way round the World, it was all the worse because we were away from home. We felt desperately sad, totally impotent and profoundly embarrassed as colleagues from around the world regarded us with a mixture of pity and suspicion. To a man and woman advertising supported Remain. Of course we did, we work in a multinational city, in multinational companies, alongside multinational co-workers on multinational brands. We believe in the European project and more than that we depend on it. London runs a huge amount of Global and European business from its advertising agencies, precisely because we are part of the EU. However, we were also heavily invested in the campaign itself. Late on, and in truth far too late, Remain issued a call to arms to the UK creative community to fight for the EU. Agencies flocked to lend a pro-bono hand and do what we do best, deliver razor sharp, highly engaging and vote winning ideas to the hearts of the electorate. Or that at least was the plan. Adverting agencies aren’t strangers to the dark art of politics. For good or ill, over the past 40 years the UK advertising industry has played a critical role in most political campaigns. From ‘Labour isn’t working’ in 1979 to the image of William Hague with Thatcher’s hair in 2001 and a tiny Ed Milliband pictured in Alex Salmond’s pocket last year, we often frame the defining image of a campaign. Although the issues at the heart of elections and referendums are usually incredibly complex, there is a role for skilful communications to crystallise the key issues for voters. And going into June that was what the Remain campaign were crying out for. Remain had won the economic argument but, just like being world champions at Real Tennis, no one was remotely interested. Remain needed a potent new message to take on Vote Leave and in particular the mileage they were making in stirring racial tension. That the voters never got this new message remains one of the greatest failings of the Remain campaign and the people, like me who tried to help. By any measure this was not advertising’s finest hour. So, how come the people behind the success of brands and businesses from John Lewis to EE, people with unparalleled expertise in reaching beyond the facts and touching raw emotions failed to deliver when their country needed them most. How could we do it for our country’s businesses but not our country itself? There is an old advertising saying that clients get the advertising they deserve. Clients that are clear about the problem they want the agency to solve and those that have the nerve to buy idea that will do the job get the best work. Those that don’t, don’t. And to be frank Remain got the work that they deserved. Yes the agencies might have created more and better work but in the final instance its not clear that there was a ever a real plan and there certainly wasn’t a great deal of nerve. Much has been made of Remain’s lack of strategy, or at any rate a strategy capable of surviving engagement with the enemy and accusations abound that they were hampered by a fear of ‘blue on blue’ attack advertising. However, the truth is that if the campaign never truly connected with people that was the fault of the politicians leading Remain not the campaigners. Although politicians rate themselves as communicators, they have lost the art of communication. They triumph in debates, they electrify hustings and they connect with constituents in their weekly surgeries. But they have forgotten what everyone learns on day one of their job in advertising. The message doesn’t matter. Or rather the message is only a means to an end, what matters is what people feel or do as a result of the message, the take out. That’s what John Lewis does so well, they focus on what they want people to take out. Politicians tend to struggle with this, for them it’s the message that matters and the message alone. You can tell this when they are interviewed after an electoral defeat because they always insist that “we failed to get our message across”. As if just one more repetition or a slightly more forceful speech would have got the electorate over the line. Never, whether it was a message that was ever capable of delivering success. And that is the failing of the Remain campaign’s advertising. Directed by politicians they stared down the wrong end of the communications telescope. They decided on their messages and then hounded the electorate with them regardless of whether they were really connecting with the people that mattered. Vote Leave, were far better at making sure they got the response they wanted. Once they had decided on a strategy of confusing the EU, which few of their voters cared about, with immigration that millions of them did, the job was complete. All Vote Leave needed to do was to make sure enough people believed the EU was the reason for unchecked immigration and they didn’t particularly care how they got there. To our country’s eternal shame this approach reached its nadir with the infamous and possibly illegal Breaking Point poster. To the advertising industry’s eternal shame this, not a pro-European poster, was and will remain the defining image of the Referendum.